A wonderfully entertaining mashup of tribal costumes, elegant and noble heroes, and superpowerful technologies set against the trials and challenges of the contemporary world. The Wakanda, a seemingly ordinary African tribe has acquired amazing abilities through the introduction of vibranium, something like a superduper power-inducing kryptonite that can work any wonder imaginable. T’Challa (Chadwick Boseman) becomes the king by inheritance, but is challenged by Erik Killmonger (Michael B. Jordan) who nurses a resentment for a crime inflicted in the previous generation. A lot of the anguish, interestingly, goes back to violence in the housing projects of urban America. Underlying that conflict, in this eloquent and entertaining allegory, is the story of heroism, despair, conflict and the attempt to restitute nobility. If there were a Nobel Prize for cinematic costumes, this production should certainly get it. The beauty of the entire array of African super-tribespeople here is astounding and the production continues, in one way or another, to show off the elegance of those creations. Equally stunning is the cast, featuring one great star after the other, showing, in this wonderfully bold exhibition of African resiliency and flair, an array of beautiful and noble characters. Even the counter-hero, Erik Killmonger (Michael B. Jordan), replete with his body etching of bumps that represent all of those whom he has killed, has a kind of tragic nobility. There is pretty much nonstop action here, and follows the idea that hiding within the superficially simple lives of these African tribespeople is a degree of technological advancement that one would have never suspected. Nonetheless, that technology only empowers the temporary usurpers and it is the underlying humaneness of the underlying traditions that gives moral weight to the supercharged battles. The details of conflict and challenge are fast-paced and somewhat daunting, but the visible evidence of whatever are the conflicts are continually stimulating. One panther arises after the next, getting coated magically in a feline skin by some transformative process that then makes them invincible. Vibranium is at the core of it, but, even so, there is a point at which the contenders have to battle without those powers and come back down to their earthly powers. At base this is what makes this movie tick, that nobility and heroism, though emboldened by technical wizardry, are at base, human virtues. Chadwick Boseman makes a distinctive king and Black Panther T’Challa, and Lupita Nyong’o a strong and forthright compatriot and lover Nakia. 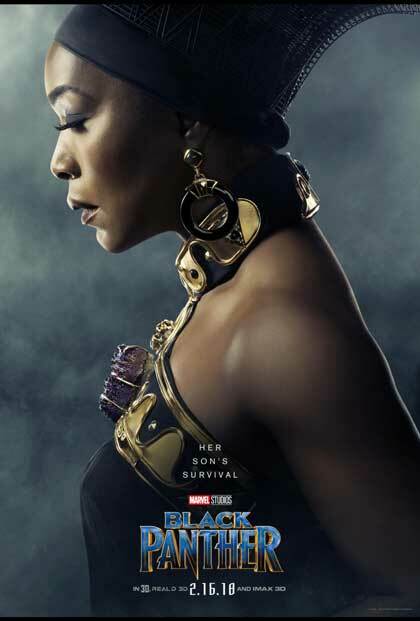 Letitia Wright is a gutsy and nervy driving force as Shuri, and Angela Bassett as Ramonda and Forest Whitaker as Zuri provide durable ancestry. Martin Freeman, of Bilbo and Dr. Watson fame, fills in as, Everett K. Ross, a friendly CIA agent. Andy Serkis makes a particularly grisly and awful bearer of unwarranted force in Ulysses Klaue. Top grades for costumes, casting and a great array of front-line actors. Narrative complexity is hidden in the intricate Marvel universe; those who live in that world will find it easier to interpret than one-time visitors will.